Common techniques to solve the problems of single antenna front- ends – especially the demand for high isolation to ensure a continuous operation mode – are duplex switches or circulators at the front-end for connecting the antenna between transmitter and receiver. However, such solutions still have their disadvantages. The power handling capacity of the switches, and the loss encountered in them, degrades both the performance of the transmitter and the performance of the receiver. Therefore, with such implementations it is very hard to create compact modules with small form factors. 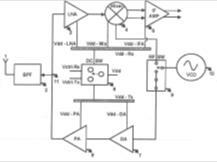 But a new technology enables to utilize an improved isolation method for integrated circuits in the high frequency transceiver front-end of a FMCW radar system. To achieve this improvement, two circuit processes (turning on and off of receiver and transmitter) are synchronized with each other. The synchronization improves the isolation properties considerably, which leads to significantly better transmitting characteristics. A further advantage of the proposed technology are improved isolation characteristics of the receive signal that are by several dimensions smaller than the transmitter signal. Thus, it is possible to utilize an asymmetrical setup of the RF-switch that reflects the unequal patterns of the transmitting and of the receiving signal. The presented technology could be used in (wireless) communication for local positioning systems (e.g. museums, harbors) and for distance detection systems in cars.